With the best value premium brand recycled cartridges, are the cartridges original kyocera FSC5100 cartridges that have been refilled? Yes, this is correct. Our premium brand recycled Kyocera FS-C5100DN toner cartridges are made using the recycled parts from an empty Kyocera cartridge which is professionally remanufactured and filled with toner by a third-party manufacturer. What is 'dpi' in relation to this machine? DPI (dots per inch) is a measure of printing resolution. The print resolution for the Kyocera FS-C5100DN colour laser printer is 600 x 600 dpi. Kyocera may not be the most recognisable name in the printer market, but that does not mean that this company's products should be discounted in any way. While their printers may look as if they were pulled directly out of the early 90's, their quality and features are comparable to all of the top competitors. The Kyocera FS-C5100DN was made to be placed in a smaller office, but have enough options to grow alongside any medium-sized business or work group. Kyocera decided to go with an aerodynamic appearance on their FS-C5100DN. The curved face of the printer leads into a basic back lit LCD screen, navigational buttons, the power button, the jam button, and LED's for low Kyocera FS-C5100DN toner and jams. A push-button hatch opens the front of the printer to access to the 250 sheet main input tray and the 150 sheet multi-purpose tray while the finished prints come out on top. The base model comes with only a basic Ethernet connection while there are upgrades for a a fully wireless system, a 1,400 sheet input, flash memory plugs, up to a gigabyte of memory, and automatic duplexing. 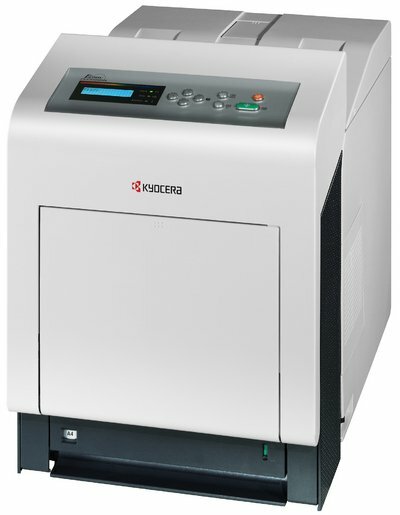 The base model of the Kyocera FS-C5100DN will meet all the basic needs of most offices or work groups. While it is on the expensive side, there is almost never a jam or flawed print to be found. At 16 pages per minute for black text and 10 pages per minute for colour prints, it has enough features for any small business with tons of options for upgrading during growth. The included software is very intuitive and can be done with little to no training. Taking just a few minutes to setup and print once it is out of the box, Kyocera made this machine with the consumer in mind. There are very few disadvantages to this printer, and most come down to cost. Not only is the machine on the higher end of the price spectrum, the Kyocera FS-C5100DN toner replacements tend to be more expensive that those for similar printers from other manufacturers. Small businesses will need to keep the price per page in mind if this printer is going to be used for a large volume of prints in a busy office.